One Plus One will be posted on the ABC iview. Have you seen Jimmy sing Good Times Feat. Keith Urban? Check out The Project with Jimmy Barnes. Great singers! 30 years on and Jimmy Barnes is still rocking! To celebrate this extraordinary milestone as a solo artist, Jimmy has recorded 30:30 Hindsite, his 15th studio album, alongside announcing the second series of what will eventually be 30 tour dates across Australia. In addition to his already announced A Day On The Green shows and special guest slot with the Rolling Stones in Adelaide, Jimmy Barnes will be travelling from Canberra, to Warragul, to Port Pirie and a whole bunch of towns in between. Over his 40 year career, Barnes has gone on to become the Australian artist with the highest number of hit albums with 14 Top 40 Albums for Cold Chisel and 13 charting solo albums in Australia – not to mention nine number ones. 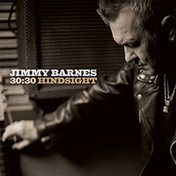 Jimmy Barnes’ tour announcement coincides with the release of a special anniversary album on 29 August 2014. The album titled 30:30 Hindsite (Liberation Music) revisits some of Barnes’ biggest hits, featuring collaborations with his favourite artists, including Keith Urban, Bernard Fanning, Shihad, Tina Arena, Baby Animals and Jon Stevens. The new recordings are brilliantly complemented by the original hit versions selected from Jimmy’s lengthy and hugely successful solo career. The first single released from the anniversary album is ‘Lay Down Your Guns’ featuring The Living End (click here to watch), the original version of which hit number one in 1990. Stay tuned for more 30:30 shows to be announced soon! Visit our store at http://bit.ly/JB3030preorder for your opportunity to pick up an exclusive fan pack! Sun 23 Nov Perth | A Day On The Green DONT MISS OUT! Pre-orders the deluxe edition now which includes 40 audio tracks containing 17 new recordings and complemented by another 23 classic Jimmy Barnes hits spanning his amazing solo career, photographic profile booklet plus the physical version will have a strictly limited, comprehensive DVD video chronology curated by Jimmy.